I have been doing CrossFit since 2010. My husband came home from deployment and said “you have to try CrossFit.” Was it hard? Yes. Did I want to quit? Yes. But I felt so awesome every time I finished a workout. In March of 2010 I was pregnant with our first child. I began following the programming of CrossFit Mom(CrossFit scaled for pregnant athletes). CrossFit Mom was awesome, it allowed me to keep working on my CrossFit skills as my pregnancy progressed. After having our son I became more passionate about CrossFit, pushing myself as an athlete. I just couldn’t get enough of it. In 2012 I attended the CrossFit level 1 certification course and I began coaching at CrossFit The Dalles. I attended the CrossFit Kids Trainer course in 2013 and designed the CrossFit kids program at CrossFit The Dalles. CrossFit challenges me as an individual and as a coach. I enjoy working with people and seeing what hard work and dedication can do. It is my honor as a coach to help people change their lives one workout at a time. My husband and I are dedicated to offering knowledgable safe coaching. Our passion is CrossFit and making a difference in people’s lives. I’ve been crossfitting since spring 2010. When i was deployed to Iraq for the second time. I decided to start watching main site (crossfit.com) videos and using whatever equipment I had to perform the WODs (workout of the day). When I returned back to JBLM (Joint Base Lewis-McChord) I started going to their Box (gym) for about 6 months. I moved down to The Dalles, Oregon in 2011 and started working out at CrossFit Mt. Adams in White Salmon, Washington. That’s when I became really passionate about CrossFit. Having a community of people all pushing each other, suffering as one, all sharing the same common goal of fitness was awesome! Having knowledgeable coaches making sure I was performing the movements safely and efficiently was huge in my progression as an athlete. I decided to get my Level 1 CrossFit Trainer certification in March 2012 and picked up coaching a few classes at CFMA. 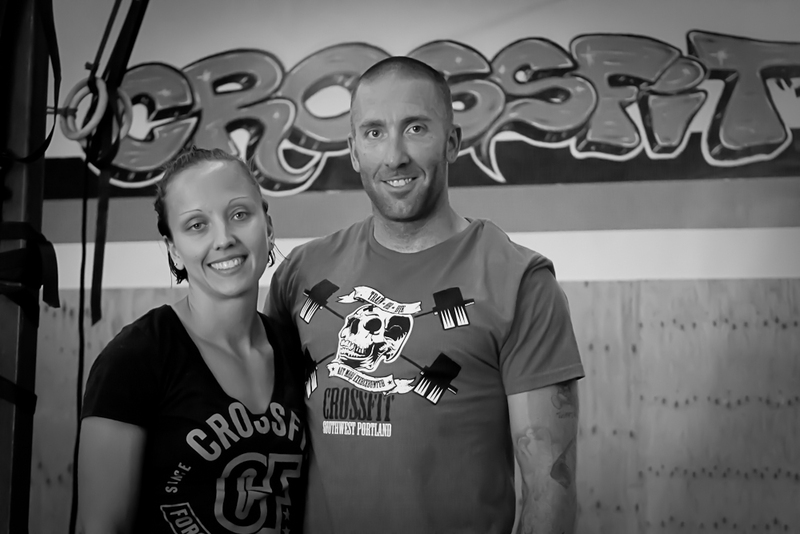 I began coaching full time at CrossFit The Dalles when they opened their doors in June 2012. Being able to make such a huge difference in people’s lives is an incredible honor and huge responsibility. I have become so passionate about coaching and helping others achieve their goals, and dreams. It’s awesome seeing people do what they never thought possible on a daily basis. My wife and I decided that this was our calling and if we could do anything in the world as a career, this is it. What time is the grand opening on the 14th? Doors will be opening at 9:30 with a WOD starting around 10. We will be posting a flyer soon! I have been waiting for a close crossfit box to open. Super excited! Glad we’re not the only ones so excited! Can’t wait to meet you Crystal! I saw on FB that you were doing an intro to Crossfit and WOD on Saturday the 13th. Is there still room and can I come try this out? We would love to have you Brian! 10:00am on the 13th.